Hands-on with this offbeat adventure. Forgotton Anne is an adventure game set in a world full of forgotten objects that have come to life—everything from rogue socks to lava lamps and scarves. Hey, maybe my old Power Rangers swimming trunks from 1995 are in the game somewhere, who knows? Last year we spoke to the team at ThroughLine Games about blending Eastern and Western visual influences in bringing the game to life, and last week I played the first hour of the game. It's a pretty, offbeat adventure with reasonably light puzzles and slightly trickier platforming sections, but it's the confident creation of this weird setting that makes me want to spend longer with the game. You play Anne, an enforcer in a realm known as the Forgotten Lands. This place is populated by 'Forgotlings', the aforementioned forgotten objects, which have slipped out of our world and into theirs where they have their own personalities and can talk. Anne and her master, Bonku, who both appear to be human, are trying to return to their world. A nearby attack by a group of rebels now threatens that return, though, and this first hour was largely spent unravelling who or what caused the attack. Anne carries a device called an Arca, which has control over the Forgotten Lands' power source, Anima. Most of the early puzzles are spent finding Anima batteries dotted around these 2D environments, sometimes hidden in secret rooms or basements, and using that power to activate devices that can open the way ahead. You can also use the device to change the direction of Anima in a circuit if you're looking to activate a particular object. It's nothing too intensive—I didn't really get stumped once by the puzzles in this opening area, which is fine by me. The platforming, though, can be surprisingly tricky. Early on, you find Anne's metal wings, which allow her to jump higher to reach higher areas. Combined with a sprint button, you can launch her pretty far. It's pretty stiff to control as platforming goes, but it works. In one tricky section, I had to hit a switch to raise a platform, then jump off an edge and grab onto the platform as it moved to reach a certain area. This took me about ten attempts to time properly, and was a bit complex with the default keybindings. Alternating between platforming and puzzles gives the game an interesting pace, however. Anne's role as an enforcer drives the story. She's policing the forgotlings, and trying to get to the bottom of who helped caused the rebel attack. The first choice you get to make features a fearful scarf, brandishing a shovel and threatening Anne not to come closer. I used the Arca to 'distil' the scarf, draining it of life so it just crumpled into a heap on the floor. 'This outcome could've been different', the game then tells me. Presumably I could've spared it, if I'd been more patient or thought about it for longer. I wasn't entirely sure the scarf was guilty (a sentence I never thought I'd write). A bit deeper into the game, I meet two more forgotlings who accuse each other of helping the rebels to cause the attack. You have to decide which one is telling the truth—and what you'll do with the culprit. The larger consequences of these choices remains a mystery, but the Steam page promises that you can 'alter the tale' with this branching dialogue system. It's a curious mix of elements, then, and yet the highlight is clearly the presentation. The world of Forgotton Anne is gorgeous. While the hand drawn-style animation seems a bit simple up close in cutscenes, in-game it creates a beautiful effect. The contrast between drab industrial imagery and beautifully lit, warm interiors in the Forgotten Lands is lovely. I thought I might find Forgotton Anne too whimsical—and there's certainly some danger of that with this many talking clothes—but instead I just want to see more of its world when the game launches later this year. 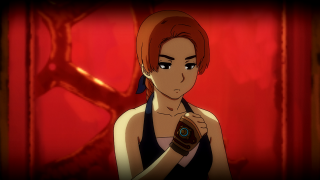 Editor's note: the game is actually called Forgotton Anne, not Forgotten Anne—I checked like nine times before publishing this.